A massive fire destroyed most of the Kandawgyi Palace in the early hours of Thursday morning, with at least one death reported at one of Rangoon’s most iconic hotels. The United Nations High Commissioner for Refugees (UNHCR) has released aerial footage showing thousands of Rohingya Muslims after they crossed the Naf River into Bangladesh. Follow DVB as we visit Kachin State some six years into the conflict there, which has displaced more than 100,000 civilians. In this episode of DVB Debate, panelists discuss how to approach issues of citizenship, conflict and reconciliation in Arakan State. 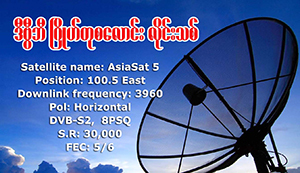 Join the ‘roadies’ of DVB’s Doh Pyay Doh Myay in Talarku Karen Village in Karen State. Watch how local people share their live stories and music. The possessions are reported to have begun at Shan Yekyaw High School in August after the school expanded its compound into a neighbouring cemetery. A new documentary from DVB examines efforts to save one of Asia’s last freely flowing rivers from the potentially devastating impact of planned mega-dams. Mismanagement and a chronic lack of funding during 50 years of military rule are the main culprits for the poor state of healthcare in Burma today. In Arakan, poverty and ethnic tension are intertwined. While 140,000 Rohingya IDPs in Arakan State face an uncertain future, one man fights to preserve their past. Students jailed after police violence in 2015 say the election of a military hardliner as Burma’s new vice president could spell a revision to the country’s political reforms. The Burma-Laos border is mostly unguarded. The terrain is rugged and hostile, where the drug trade flourishes in lawless enclaves on both sides of the river. At a school renown for discipline and training, former street kids are attempting to get their lives back on track. On this episode of DVB’s Doh Pyay Doh Myay Roadshow, the team visits Hpakant in southern Kachin State, where the hunt for Jade is intensifying as political change in Burma looms. Aung San Suu Kyi met American diplomats on Monday as Burma transitions to a new government after her party’s sweeping election victory last November.